Hidden sanctuary in the city. Walk to everything! If you are looking for reasonably priced accomodation that is safe and secure and close to everything, then this is it. Within a few minutes walk, you can be on the Waikato river to walk or bike the 10kms of river trails that meander to Horitiu in one direction to the highly acclaimed Hamilton Gardens in the other direction. Next door to a world class Gym that has a great cafe for healthy breakfasts, lunch or snacks and coffee. Fastland Fitness offers casual use of their Gym for $15, or use of their pool for $7.50. Step a little bit further down the road and there are restaurants of all ethnicities, bars, and cafes, Sky City Casino, shopping and movie theatres. Waikato Stadium is within easy walking distance too. Hamilton is ideally situated as a hub for many touristy day trips. Hobbiton (59kms), Raglan (46kms) and Tauranga beaches (105kms), Rotorua (106kms), Waitomo Caves (75kms) and Otorahanga Kiwi House (60kms) . Hamilton also has a zoo which is well worth a visit. Pets welcome with prior approval. Rates will increase during Hamilton Special events, eg Field days. 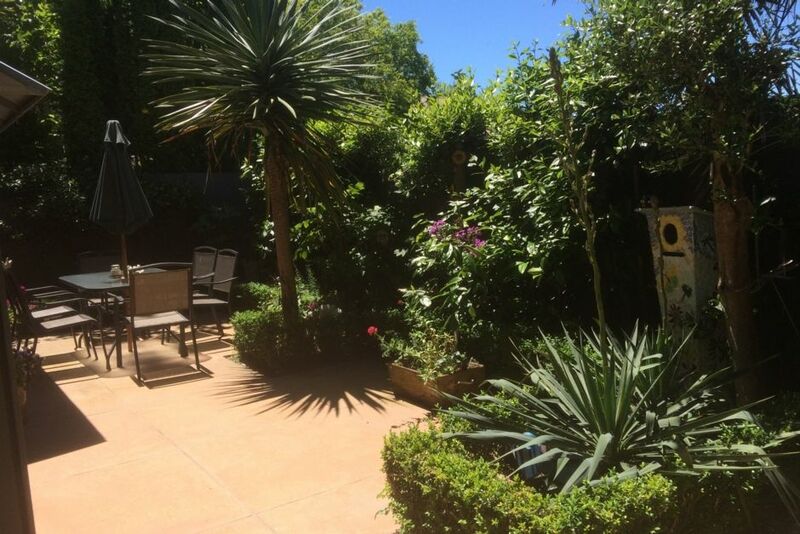 Private patio and garden area... put your feet up, get out the nibbles and pour the wine! A hidden sanctuary just off Hamilton’s Main Street..... unit is quiet and private. Restaurants , bars, movie theatres, casino and museum are within easy walking distance. Wonderful place to stay. Walkable to stores, restaurants, pubs. Great place, fabulous patio, wished we had stayed longer! Great accommodation with everything you need! Very impressed with our stay at this lovely little sanctuary. It had everything that we needed during our stay. It is in close vicinity to supermarkets, cafes, the gym, swimming pool, riverside walks , service stations and more. There is a variety of breakfast options available which is more then you'd expect for a continental breakfast. It was very clean and tidy and the bed is very comfortable. On a beautiful sunny day eating in the courtyard is very nice. Overall we throughly enjoyed our stay and would highly recommend this place. Donna has thought of everything to make this a very comfortable stay. It really is a home away from home. Although compact, it offers everything you might need. The location is wonderful - so close to the river and also an easy walk to restaurants and the main road. The courtyard is lovely - very pretty and private. We were so grateful to be able to stay here with our little dog who needed to go to a specialist vet in Hamilton. I would recommend this accommodation to anyone. Thanks again Donna - we look forward to staying again. A lovely, clean and well equipped property. Comfortable bed and plenty of space. Easy kitchen. Breakfast provided and well stocked for coffee and tea. The garden is delightful. Very easy access to the town and major roads. An excellent base for sightseeing a very interesting area. We would highly recommend for a stay in Hamilton. And we would recommend a stay in Hamilton! The batch was very cosy, comfortable and so clean. The batch was very cosy, comfortable and so clean. Thank you for the incredibly generous breakfast! Very handy to the centre of Hamilton, cafè, restaurants and shops, as well as to Claudelands Event Centre. The unit is beautifully situated down town but is totally private and quiet. It is minutes walk from the Waikato river, with many kilometres of river trails to walk or cycle. Hamilton is blessed with world reknown gardens, an arboretum, a zoo, casino, movie theatres, museum, shopping, and many restaurants, bars and cafes.